I thought you might enjoy a quick tour of a software program typically used by hams when they are on the air. 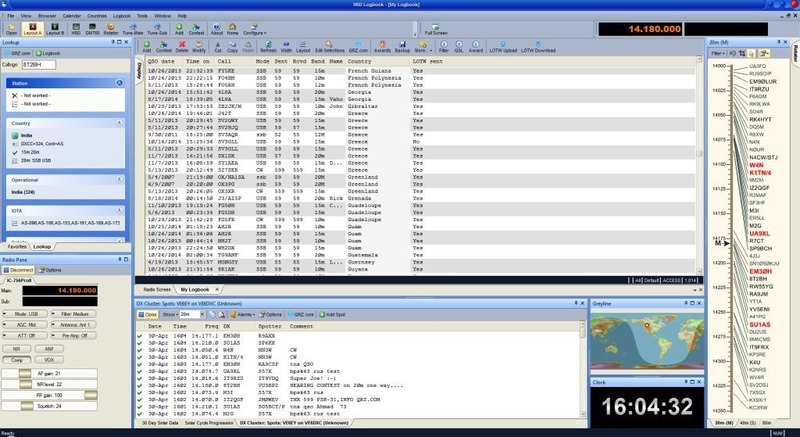 Ham Radio Deluxe, or HRD is a Windows application used for integrated radio control and contact logging. The upper center of Ham Radio Deluxe screen above is the log book. Here is where I capture information about all of my ham contacts on the air – date, time, frequency, call sign, and so on. I also use this logging database to keep track of confirmations using Logbook of the Air and other means. These confirmations can be used for awards. On the lower left corner is the radio control window. It automatically tracks radio frequency and mode, and automatically transfers this information the log book. In the lower center is something called “DX Cluster”. This is an online service hams use to notify each other about what foreign stations are on the air in real time. 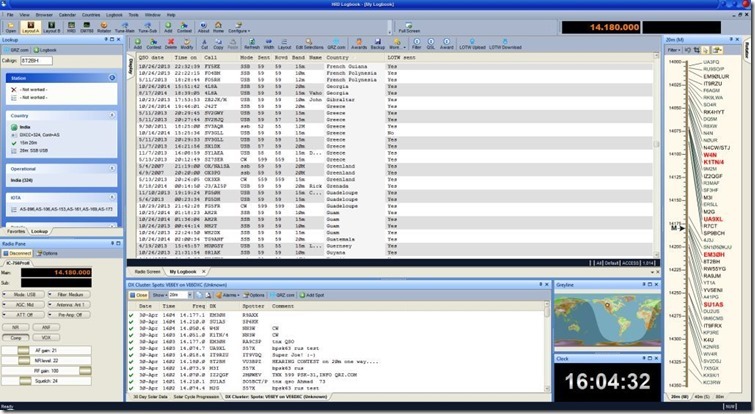 This information is also shown in a real time frequency map on the right of the screen. If you want more detail, you might check this video review. HRD was created by Simon Brown HB9DRV (and the late Peter Halpin PH1PH) in 2003. It was developed by these European hams as a free program. Gradually, they expanded its features and developed a base of 100,000 users. During 2012, Simon sold Ham Radio Deluxe to a group of U.S. hams and it went commercial. I still use his last non-commercial version 5. Born in the UK, Simon has now returned to England as G4ELI. His latest project is the wonderful SDR-Radio for software defined radios, which I also use. He makes this software for the signals intelligence market on the commercial side, but provides a free version for hobby use. I have never met Simon. We both started writing software for radio control about the same time. Ergo 4 came out in 2001, HRD arrived in 2003. Over the years, I was approached three times to commercialize Ergo for the SIGINT market but, perhaps foolishly, I was never willing to give up management consulting for software development.